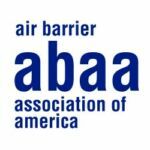 The Air Barrier Association of America (ABAA), an international trade organization, is pleased to announce the creation of a regional advocate position for the association. This position will provide regional support in the areas of education, providing support to ABAA members and becoming a resource for the local design and construction industry. The qualifications for this position was that the individual had sound technical knowledge, ability to provide AIA education, a highly visible person in the specific region and an active member of the association. We are pleased to announce that Mr. Roy Schauffele, FCSI, CCPR, FABAA, LEED Green Assoc. of Division 7 Solutions has been appointed as the first regional advocate for the State of Texas. Roy has served as ABAA’s chairman and a active board of director for many years. Roy is one of three individuals that have ever been appointed as a FELLOW of the association for his service and guidance to the industry. The Air Barrier Association of America (ABAA) is a national, trade association that consists of a wide cross section of members in the building enclosure industry. ABAA is the national voice of the air barrier industry and has raised the level of quality in the industry through a Quality Assurance Program and is active in the areas of research, education, standards development, building codes and technical resources for the air barrier industry.